Metro Detroit women are invited to showcase their support for women’s heart health by attending the Go Red For Women Luncheon on Feb. 12 at the Detroit Marriott at the Renaissance Center. The luncheon kicks-off at 9 a.m. and features health seminars, screenings and a silent auction. 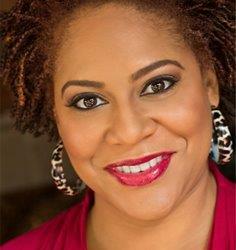 Kim Coles, actress, author and comedian will serve as keynote speaker. Returning to lead this year’s fundraising efforts are co-chairs Sharyl Smith, vice president, marketing, McLaren Macomb, and Janice Cosby Bridges, vice president, Ascension, chief communications marketing officer. The luncheon is projected to gross $750K benefiting cardiovascular research in southeast Michigan. According to the American Heart Association, heart disease is the No. 1 killer of women, causing one in three deaths each year. That’s approximately one woman every minute. But it doesn’t affect all women alike, and the warning signs for women aren’t the same in men. Coles, who is known for her roles in “In Living Single” and “In Living Color,” supports the campaign because it helps women of all nationalities take charge of their health. In addition to the expo and silent auction, attendees will hear an inspiring message from the noted celebrity. “Good heart-health boosts our ability to embrace special moments shared with loved ones,” said Coles. “Without our health, we can’t live, love and laugh,” she added. Campaign organizers also hope women feel empowered to schedule their annual well-woman visit, which is an annual check-up that gives your doctor the chance to spot the signs of heart disease and develop a plan of action. “About 80 percent of heart disease and stroke events may be prevented by lifestyle changes and education. Fortunately, we can change this statistic by scheduling well-woman visits, which can give a head-to-heart-to-toe view of a woman’s overall health,” said Coles. Individual tickets are $250. VIP tickets are $500 and include an afterglow event with a private meet-and-greet with Kim Coles. Valet parking is available at the Detroit Marriott for $25 or at the Beaubien Place parking garage for $15. For information about leadership or sponsorship opportunities, contact Mindy Lopus at 248- 936-5818 or visit detroitgoredforwomen.org to purchase tickets. Follow the luncheon on social media at #DetroitGoRed.